The big day is finally here marking ODBD's 2nd Year Anniversary! WOW!! Kelley has come a long way and so we're celebrating that success in a big way with an ANNIVERSARY STAMP LINE REVEAL on this Blog Hop. Our Design Team and Challenge Team MEMBERS have all worked hard to create something wonderfully inspiring for this great occasion. Click here to see the 4 new FABULOUS Stamp sets of Scriptures and Borders that are being revealed today in honor of ODBDs' Anniversary. But wait, along with this fab reveal, the HOP has equally FABULOUS prizes that Kelley is generously giving away to 3 winners. 1. Hop from first to last, and collect the secret LETTER each designer will have AND Leave a comment for the designer's blogs. 2. Return to ODBD blog, leave another comment saying you visited all the blogs. 3. Email Grace at: gnywening@yahoo.com, with the secret message from bloghop letters. 4. You have until 8:00 PM EST on Mar 18th to complete the hop & email the message. *Note* If for some crazy reason you arent able to get on a blog, or find the following posting for this bloghop, simply return to it shortly thereafter as sometimes there may be temporary technical issues! :) And I know that first hand as I had serious Internet accessing/freezing-up troubles this AM. These are for special little RAKS I have planned. What do you think? Now that you've read all the BLOGHOP particulars, my special LETTER is: *B*. Your next stop from here is Natalie! Oh, oh, oh!!! WOW! Gorgeous creations! Oh my goodness, those are just the cutest! LOVE them! I need to bookmark those and give them a try! Beautiful! Have a blessed day! Oh wow America!!! What gorgeous little spring gift bags!!! Love them all!!! Girl you are a machine! Your little bags are wonderful! Each one unique and fabulous! how fabulous are these America!! what a special gift they would be for someone! may have to make some myself :)! Who wouldn't love to get these RAK's. Beautiful color choices. Oh my word America these are sooooo awesome!!!! WOW WOW WOW your work is amazing, lovin all the colors here.....Beautiful job showcasing girl! America, what a wonderful project! All those gorgeous yummy colors and bling! Wow, very very beautiful. I love what you di d.
How adorable are these. They will certainly make some people happy. OMGOODNESS!! no way! how fabulous are ALL of those America!! do you ever sleep??!!! What can I say?? They are all gorgeous!! Oh wow America!!! What stunning spring gift bags!! What an awesome way to showcase those verses!! The colors and all the added bling is so elegant!! I think you've been very creative........love it....them!!! WOW... I'm imagining a ton of uses for these lovely gift bags! Nice!! Wow! Was one of the RAKS planned for me?!! 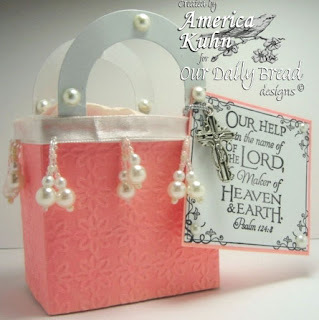 I love the little bags and I love the scripture verses! TFS! Wow - you blew me away with your bags!! Those are truly fantastic!! What beautiful bags. Love the glitter and the verses add so much. what do I think? I think you should send me the 2nd one, the little pink one! LOL- these are adorable and I am sure those receiving will love them immensely. Great job. These are just too cute! They are different. Thanks for sharing. What cute bags, I can picture them decorating a table at a womens luncheon. these are just precious!! What a labor of love! What cute little bags!! Such an imagination. TFS! OH...MY...GOSH!!!! America, you have outdone yourself AGAIN!!! My eyes totally popped when I saw these beauties!!!! My favourite colour is blue - so that one is my fav, but they are all GORGEOUS!!!! 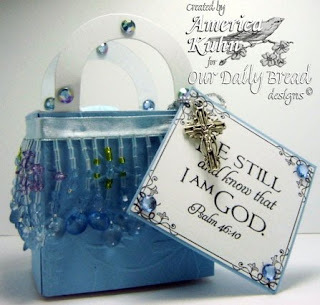 I love this little bags with Scripture tags. Very sweet! It makes me want to get started right away on some. God bless! OMGosh! 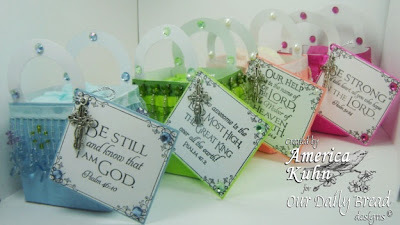 What fun and creative baskets and love how you used the scriptures for tags. Great colors and just love the bling bling on each one. Thanks for this inspiring idea and MOJO! You're one creative lady, America. Great idea, great output. What a GORGEOUS set of gift boxes! I love the beads and each one that you designed along with the Scriptures! TFS! These are darling! What a great idea! Thanks! I love these cute little baskets. what a cute idea I know the receivers will love them. OMG! !These are absolutely stunning. What a fabulous idea. These are so pretty! What a great idea to use as tags. America, what a great way to share the Lord's words with others! Thanks for the inspiration. Omigosh!! Wish I was one of the lucky (blessed) ones receiving a gift in one of these. Such a cute idea, those would make great gifts. These are simply adorable! You did an outstanding job with these, the recipients with be delighted! LOVE LOVE LOVE this idea!!!! I want to go make some now!! (ha---I just need the stamps) GREAT JOB!! WOW! Look at you go!! These are all so beautiful! So much time went into these, you can tell! Stunning! Cute gift bags! They make great RAKs! Oh my goodness, America! These are fabulous! Each and every one is amazing and beautiful. I love the different colors and verses for each. Terrific! Wowee, what amazing little bags!! I'm sure these RAKs will be purse-sonal faves of the recipients! Wow!! These are beautiful and would be perfect for Easter!! I am amazed at your creativity!! Wow! Love them! So pretty! Thanks for showing a differnce way of useing these stamp just love it u could never have to many purses. These beautiful bags with the verse are sure to brighten up anyones day!! To God be the Glory!! How very creative you are! what a great use of these scriptures. Love them! You are killing me with those ADORABLE purses!! So, one of those has my name on it...right? :) Lovely...simply lovely!! These are adorable and will make very special gifts--great idea! These are fab! The blue one's my fave! 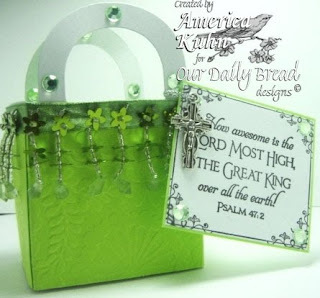 Oh my goodness, I LOVE those little gift bags w/verses! Too clever! Gorgeous! These are beautiful and I definitely think anyone would love to get one!! These bags are too cute!! !...a great idea to use the scripture as a tag. You have inspired me. Thanks!! Totally awesome gift bags, America, Love them. Love how you used the frame and verse and the charms, pearls, bling on them. Wonderful little creations. Thanks for sharing them. OMGoodness America, you have outdone yourself here my friend!!!! These are all so beautiful! What a great idea for gift bags! I love the way you used the verses for tags on each bag. Thank you so much for sharing your lovely creations with all of us. God bless. Those are so cute. Those are the cutest gift bags. I would love to be on the receiving end. Oh my goodness--these little gift bags are too cute and so colorful!! They are so cute!! What a great idea!! I think these are amazing! Wonderful way of spreading the Word. Adorable! Thanks for providing so much inspiration through your blog. WOW! Love these gift bags! Very unique & very creative! Oh my goodness, what a treat for the eyes. Thanks for the altered project!!! You are too much, America! This project is just wonderful! These bags are wonderful! Great job!! Love that you made cute little purses--nice change of pace during this blog! Oh my Goodness! How adorable and lovely are these little bags!?! I bety they were a lot of work...really lovely! Absolutely adorable gift boxes! I love the colors and all the embellishments. What a great idea to use the verse as the gift tag, really adds just the right touch! Oh my goodness! I am just blown away!!! These are sooooo fantastic!!! You are so creative and clever!! God bless!! These bags are beautiful, great little goodie purses! The tags are spectacular, wow! Gorgeous . . . I am such a "Bag Lady"
I just love your idea and they turned out beautifully!!! Well I think they are gorgeous and I am sure the recipients will too. I love these adorable bags! I would be so happy if I got one. :D Your recipients will love them. Thanks for sharing them with us. Those are RAKS that will be a great blessings to the recipients! These are just amazing America! Wow! So pretty and Spring-like! Fabulous idea! These bags are sooo cute! Thanks for sharing them! where did u find those dangling pearls? WOWZERs, America!! These are just stunning! I love all the added pearls and jewels!! Sooo pretty!! Oh My! Wow, America, I could not wait to get to your name on the blog hop. (But I did.) You always WOW me with your creations. You have done so today as well. They are all so beautiful...I love the colors, and the beads and rhinestones...these are just magnificent. What a great idea. I may try this, with your permission, at Christmas time, when the children are ripping through gifts, but need to stop and pause to read the "To and From" tag...and thank the person...on command! This way they will pause long enough to read the tag with the scripture From let's say Luke 2. And, everyone else will hear it, too. How awesome!! Love the beautiful spring colors and those adorable gift tags! Thanks for sharing! Beautiful gift bags! 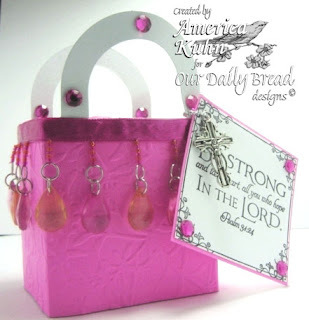 Love the spring colors and those little cross charms on the tags are awesome! How special are these! Who wouldn't to receive one of these little jewels. too cute , too cute, too cute. these are adorable. These bags are so cute and a good way to showcase the wonderful verses! I would love to make them for a church Mother and Daughter banquet--or any other occastion for that matter. You have done a beautiful job with them! God Bless you! Lovely gift bags, my faves are the green and blue ones. WoW! what creative, colorful and encouraging gift bags! Wow! These are so adorable! I love all the beautiful spring colors! What a great job on all of them! America, these are just the cutest, prettiest little treats ever!! I love them! I am so happy to know you and for you to be part of our team! Thanks for all your awesome support! These are wonderful little bags! Love them. The recipients of these RAKs are going to be THRILLED! What a bunch of inspiration! These bags are wonderful, you are so creative America!! 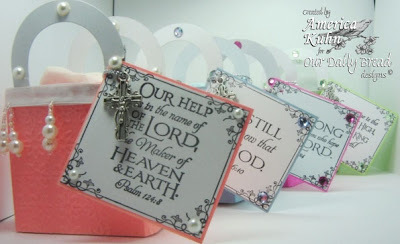 Love the verses on the tags, what an inspirational gift idea! Beautiful! God bless. These are going to be awesome for your planned RAK. Very lovely way to showcase the new stamp sets. Wow these are very nice! wow! these are happy and elegant at the same time!!! Cute, cute, cute!!!!! Love them. I think that they are fabulous for your RAK's. What a great idea for another use of the stamps! Wow - who wouldn't want to receive one of these! So darling. Love the bags you made. Gorgeous! Beautiful bags! Love the stunning array of colors! WOW!!! So beautiful! What a wonderful RAK... I love the charms, too! America, your little creations and card are awesome. Oh my! I love this idea and want to try it!Absolute gorgeous!! Awesome! What a wonderful gift idea! TFS! Love,Love,Love your little bags... wish we were friends!!! Super Cute! i love all the wonderful colors u used! Awesome idea! Love the colors. Very springtime, and your embellishments are wonderful. I want one. Such a creative idea. Your giftbags are soooo cute. Love the beads and bangles on them too. Wonderful way to show off the verses. WOW! These are all so gorgeous. I love all the colors. What an amazing gift bag these will be. Great gift bags. Beautiful work. I would love to get one of your RAKs! America, these are fabulous! What awesome colors and the beaded trim is so wonderful.